Think of the best modern tv-shows. The best of them are ususally characterized with a great number of seasons (like The Office or Friends), and why do you think it is so? It is easy, their makers just know that the fans are looking forward to more of their favoirite characters. That is, I guess, one of the reasons why the shows are so successful, but only if the cunsumers don't get bored with the characters. And this has worked out with Flo and her Grandma. The game seems to balance the challenge perfectly without being frustrating. 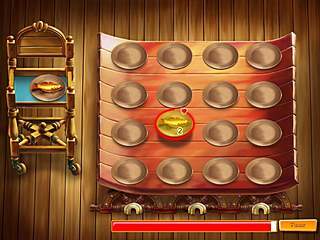 In Cooking Dash 3: Thrills and Spills the challenge is going to take place back in the past when Flo was a teenager helping Mr.Big at the restaurants in the theme park. 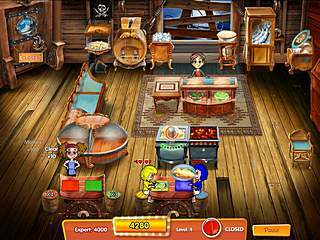 The game spreads over 50 levels which are broken into 5 groups for the five restaurants. All of the restaurants are absolutely different and uniquely themed. The appearance of the restaurants can be changed by you in many various ways. Most of the time is spent on cooking and serving quite a number of dishes, desserts and drinks. So the food differs depending on the restaurant. Some of it, like cookie, can be picked up and served, but it takes several steps to prepare the others. After each level you have an opporunity to upgrade your equipment and decorations. The other option is to increase Flo’s speed, or make her throw dirty dishes away to clean tables, or buy a music player to increase patience of customers that are waiting in line. The upgrades that you choose often determine the way you are going to play the next level. So you have to do your best at guessing. If you have played any of the previous Cooking Dash releases, you won't be surprised with the upgrades. There is an expert mode, which is an analogue of the endless shift in Dining Dash series. This mode practically doubles the playing time. Completing the levels with the expert time, getting a certain score and completing every mode will be awarded. The mini games blend into the game very well, but they are skippable for those who don't really want to play them. They are pretty simple as well. There is a chance for you to get a new meal for the next level. 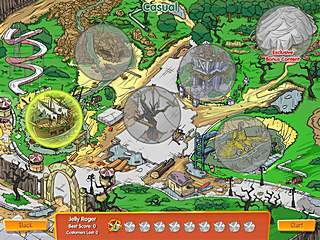 You get it, for example, by finding items on a scene or by clicking on the falling food avoiding forks. One obvious change that those who's palyed the previous Cooking Dash releases will definitelly notice is the way you seat the customers. This time you are seating them at the tables. Plus there is a drive-in. And the whole seating system is based on the color-matching. The audio-visuals add to the general pleasing presentation of the game. All of the details are polished and worked out. This third game in the series has it all in respect of the major production values. This is Cooking Dash 3: Thrills and Spills CE for Mac OS review. Download this game here.